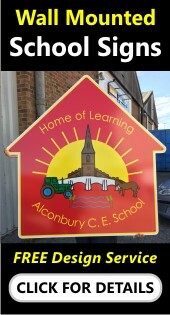 If you would like to order a new School Sign, School Display or a School Notice Board our experienced designers will work with you to create an eye catching design for your consideration. 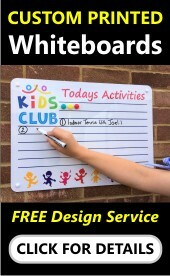 We have offered this service for many years and it allows you to see what your proposed new school sign or school notice board will look like as well as how much it will cost before you place your order. A/ We ask that you send us as many details as possible about what is required. ie what type of school sign or school noticeboard do you want ? what colours would you like used ? tell us the wording and include copies of any school logo's or crests that you would like included. What sizes do you require ? Would you like Protective Face Film ? Do you want supply only or would you like us to quote for installation ? We find that many of our customers also like to include a simple sketch drawing / layout to help our designers understand what is required - Please send us as much information as possible about what your require. 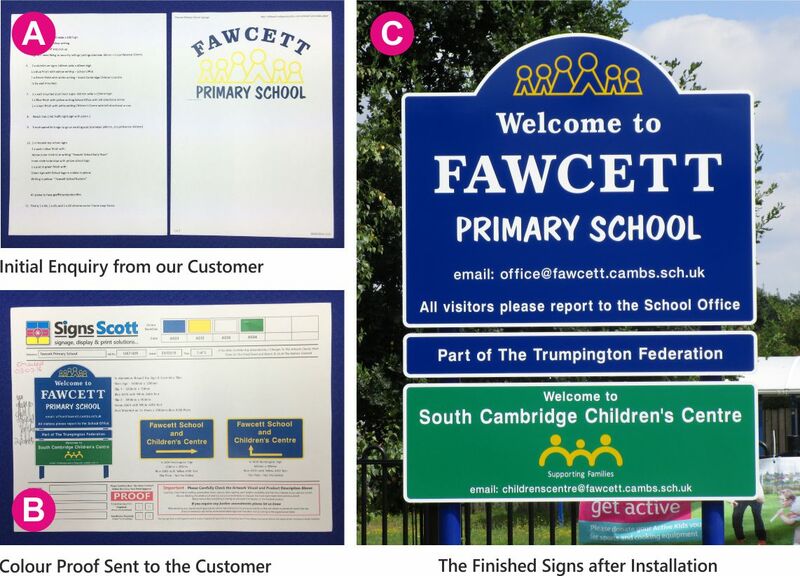 B/ From the information you send, our designers will work with you to create a colour proof showing what your proposed new school signs or school notice boards will look like. This proof will be sent to you along with our written quotation for your consideration. You make amend it, tweek it or change it as much as you like until you are 100% happy. C/ If you are happy with your proposed design and would like to accept our quotation all we ask is that you sign the proof form and return it to us along with your official purchase order. Only after we have received the signed proof sheet will your order go to our production department. When your order is complete we will either send the items to you via our courier service or we will contact you to arrange a suitable installation date if you would like us to install your signs. If you need to send artwork files to us we want to ensure that your order runs as smoothly as possible. Correctly set up artwork is critical to ensuring that the finished prints / graphics are exactly as you expect. To Upload your files to us please follow the link below to transfer your files to us. Photos Scans & Images: - Images should be provided at a minimum of 300dpi size for size and saved in CMYK format. TIFF file formats are preferred but we also accept images in any other formats including JPEG and EPS. Care should be taken when providing images in other formats as compression may be used that can reduce final quality. Bleed: - No bleed area is required unless stated on the PDF or Quark template file. Please ensure that images within the image box does extend to the very edge. Occasionally we notice that when working with layouts at 25% it can be difficult to see exactly where the image finishes. We recommend using a red box infill colour that is easier to spot when the image is magnified on the computer monitor before saving. Colour: - We recommend using Pantone® or RAL colour swatches rather than relying on screen colours. If you use screen colours as a guide, ensure that your monitor is correctly calibrated. Logos: - All logos used should be .eps vector files (these can be enlarged to any size without degradation of quality). If you do not have an .eps version, we can recreate from .jpeg or .tiff file supplied (approximate studio charge £40.00). Fonts: - When collecting files for output, please ensure that all fonts used are included. Experience has shown us that whilst fonts may use the same name, slight variations do exist. Therefore we advise not to rely on fonts from another source but to send fonts with finished artwork. Fonts used in Illustrator, Freehand, InDesign and CorelDraw can be converted to boxes/curves before saving to output and therefore no font files will be required. To do this, select all and then convert in one action. PDF proof files are emailed to you for approval or amendment. Colour Reproduction: - Whilst every care is taken before and during the printing process. Signs Scott Ltd will not be liable for any colour discrepancies, or poor quality image resolution, on finished products, where artwork is supplied by a third party. Screen calibration, and computer interpretation of colours and shading may mean that what is seen on screen may not be exactly replicated on the finished product. Customers are asked to provide hard copies of the required artwork, if they feel this may be the case. Sending Artwork: - We can receive artwork in many formats. Please always send a separate low resolution PDF of all artwork so that we have something to check files against. We have a fast Broadband connection so file transfer is fast. If you are sending a number of files, send them in separate emails to minimize file corruption. Our preferred method, if time allows. Please also enclose a printed copy of all artwork with your CD.